The production of “The Marriage of Figaro,” performed by students of North Dakota State University, is a classic example of romantic comedy and one of the world’s most performed operas. NDSU professor of music and show conductor Virginia Sublett was kind enough to grant me an interview about the upcoming show on the evening of Friday, February 17th and the afternoon of Sunday, February 19th at the NDSU Festival Concert Hall. “The Marriage of Figaro” is easily one of the most famous comedic operas. The libretto features many tropes of the romantic comedy, including slapstick and mistaken identities, but it ultimately also has heart. “It’s a story of forgiveness,” Sublett said, though the pathos is lightened with comedy. “It’s about the interpersonal relationships between a man and his wife and two of their servants and the rest of the household. The story involves the Count and Countess of Seville. The Count is a philanderer, which causes much grief for his wife. His most recent scheme is to delay the marriage of one of his servants, Figaro, to another servant named Susanna in order to exercise his “right to the first night” (droit du seigneur) as Count so he can bed Susanna himself. Ultimately, the servants and Countess work together to trick and expose the Count’s womanizing ways. Where this particular production differs somewhat from other productions of “Figaro” is that the action, while still set in a castle in Seville, Spain, is now taking place during the “summer of love” era in 1967 and 1968. Also, instead of the libretto being performed in the original Italian, the cast will be singing an English translation. Some opera connoisseurs might consider performing an opera in any other language than that in which it was written as sacrilege, but Sublett stood by the decision and made a strong argument for having the production sung in English. “It’s important in opera to understand the story immediately instead of reading a synopsis or supertitles. With comedy it’s important for the audience to get the jokes.” She stressed that she believed that the language could create a “veil” between the actors and the audience. She also pointed out how some opera houses in Germany will perform operas translated into German and still bring in the audiences and do justice to the material. This production of “The Marriage of Figaro” is not only conducted by Sublett, but also brought in a guest stage director, Walker Lewis from the state of New York. 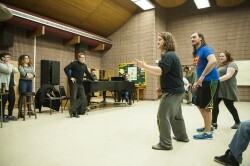 The entire cast of the opera is performed by students in NDSU’s music program, ranging from freshmen though students pursuing their master’s degrees. The performing orchestra is about half-and-half, comprised of both current students at NDSU and professional string and wind players from the Fargo-Moorhead Symphony Orchestra. “I hope people come out and see it. I think they will really enjoy it,” Sublett said. If you are looking for some entertainment this coming weekend, it would be hard to go wrong with NDSU’s production of Mozart’s operatic classic. Whether you plan on bringing a date to this classic romantic comedy or going solo, you will be supporting current and future musicians as well as enjoying a comedy that touches on the mysterious and always resonant ways of the heart.